Global superstar Michael Bublé is scheduled to release ❤️ (pronounced love) as his first studio album in two years on November 16th following a two year break from public life to spend time with his family. The announcement was officially confirmed by Reprise Records who will be releasing the multi-Grammy Award winning artist’s 8th album for the label and his most romantic record to date. The Canadian singer-songwriter returned to the studio with a new perspective on life and a renewed commitment to honoring the music he has always loved. ❤️ is available for pre-order now and includes the song “When I Fall In Love” to stream and download as an instant-grat. Watch the official music video HERE! “I didn’t anticipate returning to recording or performing and I was fine with that. My entire world view has changed completely these last few years. I wanted to spend all my time with my wife and kids. That was my focus. During that time, I also learned how much love and humanity is out in the world from the prayers and good wishes we received. But slowly, along with understanding what my priorities in life are, I began to feel a new commitment to express the emotions and lessons I’ve embraced. Whether I am the narrator, the observer, the main character, the dreamer, the broken hearted guy at a bar or having the night of a lifetime, I have stories to tell on this record. It’s all there in the songs. I have had so many blessings in life and one of them is that I hold the torch to keep these songs alive for generations to come. I take the responsibility very seriously. My end game for the new record was to create a series of short cinematic stories for each song I chose and have it stand on its own. I’m so proud of what we accomplished,” commented Bublé. Bublé co-produced his new album and brings new love to several rich classics from the American Songbook. 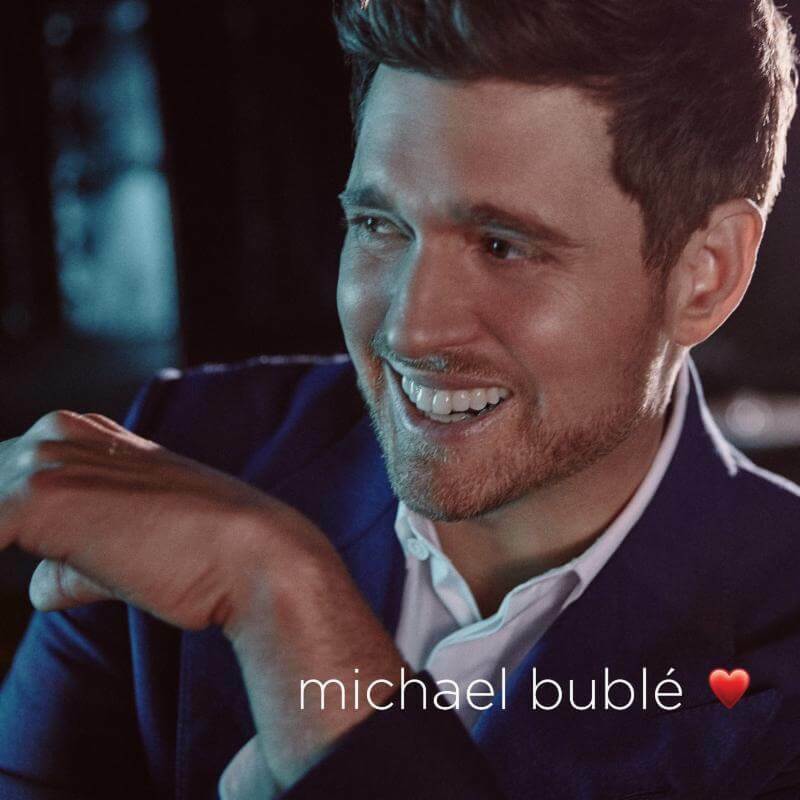 The album opens with the idealistic and dreamy “When I Fall In Love.” It also includes a haunting take on another Rogers & Hart standard, “My Funny Valentine.” Other standouts are an ebullient “When You’re Smiling,” a swinging “Such A Night” as well as Bublé’s hand-picked favorites including “Unforgettable,” “Help Me Make It Through The Night,” and “I Only Have Eyes For You.” Two standout tracks are Charlie Puth’s swinging “Love You Anymore” and an achingly poignant “La Vie En Rose” – a Bublé duet featuring singer Cecile McLorin Salvant. A touching Bublé penned original ‘Forever Now” demonstrates his songwriting skills, which were previously shown in such Bublé written hits like “Home,” “Haven’t Met You Yet” and “Everything.” The album closes with a show-stopping version of “Where or When.” ❤️ was produced by David Foster, longtime collaborator Jochem van der Saag and Michael Bublé. The trio brought Bublé’s visions to life with luscious arrangements surrounding his rich vocals. Michael Bublé has sold over 60 million records worldwide, performed hundreds of sold-out shows around the globe, and won four Grammys and multiple Juno Awards during the course of his extraordinary career. At two sold-out shows this past summer in London’s Hyde Park and Dublin’s Croke Park, he received an overwhelming welcome back to the stage from more than 100,000 fans. Bublé is scheduled to perform at London’s 02 Arena on September 29th and Sydney, Australia’s Allianz Stadium on October 5. Previous: Win Cher’s DANCING QUEEN!